Book in advance and save up to 20%! Book online & enjoy our best and most flexible rates! 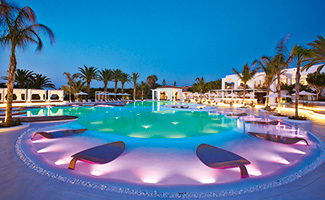 Grecotel treats all its guests like VIPs but recognises that some have greater needs and expectations than others. With this in mind, our designated VIP team works with the staff of our more high profile guests to ensure that their additional requirements are catered for prior to, during and even after their stay. Grecotel’s VIP service is discreet and intuitive, extensive or minimal. It’s a bit like having your own personal genie, only there are no limits to the number of wishes you can make. At Caramel, no detail has been left to chance, but there are many that remain flexible to your needs. To ensure that you enjoy your stay with us as fully as possible, we invite you to customise your booking to suit your preferences, from mineral water to menu, pillow type to private transfer. Grecotel’s guests are invited to make as many or as few requests as they wish, as private or as extravagant, prior to, or during their stay. Our dedicated staff will assist with all arrangements and appointments throughout your stay, whether that’s working with the chef to plan a special meal or menu, booking a massage in your suite (selected) or villa, or hiring a yacht or helicopter for your transfers. To personalise your stay, CLICK HERE to fill in online the Pre-arrival Services form. By taking the time to inform us of your preferences in advance of your visit, we can cater to your exact wishes from the moment of your arrival. Incredible holiday means splashing around with your loved ones! And you know you are in Paradise when your drink arrives at your private pavilion-cabana in a fresh pineapple. Resort beach bag with towels & beach accessories! Enjoy snacks, refreshing drinks & fresh fruit juices, relaxing under the shade of your private gazebo. 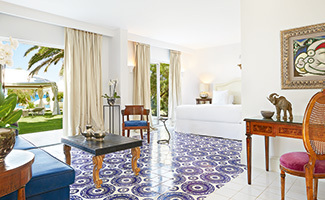 We are happy to unpack your luggage so you'll have plenty of time to discover our resort.